The forest was clothed in an uncomfortable silence. 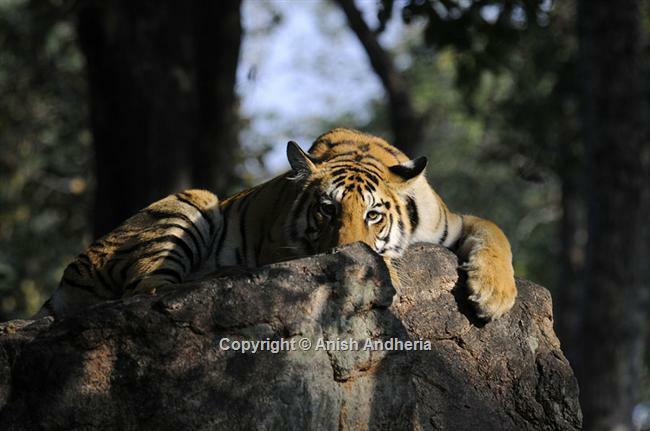 Within seconds, I caught glimpse of a 16-month-old female tiger cub resting on a huge rock. Her sister lay below a small sag (Tectona grandis) tree, less than 10 metres from her. Within minutes, two more cubs revealed themselves. They were resting close to each other, diagonally opposite from the first two. 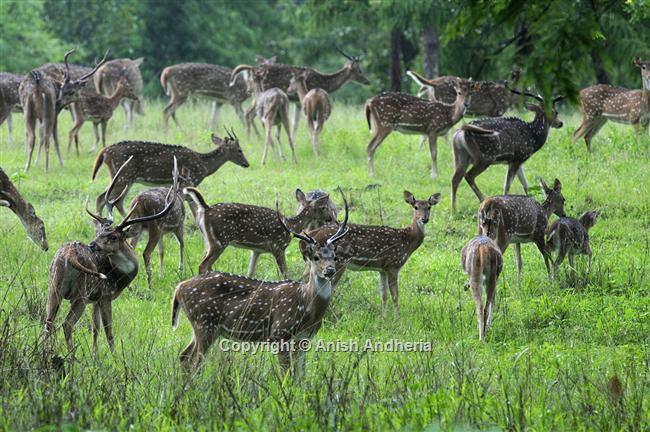 After a brief search, my eyes caught sight of their male sibling, sitting regally at the base of a huge baheda (Terminalia bellirica) tree, gazing intently at a herd of chital (Axis axis) more than 250 meters from him. I had visited Pench, Madhya Pradesh yet again to meet this magnificent tiger family of an adult female (popularly called the Pattewali, after the radio-collar around her neck), and her five cubs. 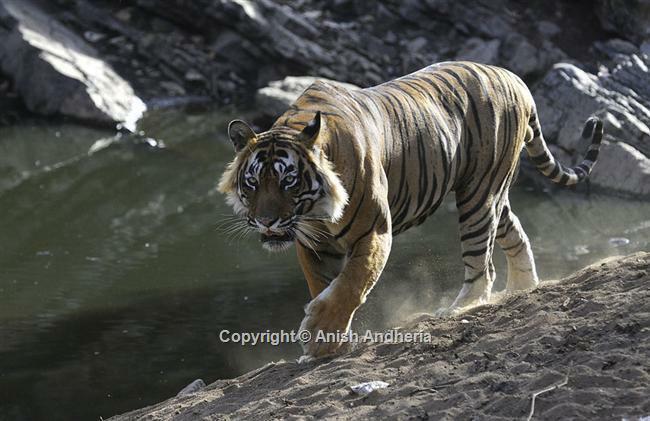 Scientists and I have been following the epic journey of this tigress as she brought up a litter of five. This was my fourth visit to the park since I first saw them as four-month-old wobbly bundles of fur. All five cubs were looking extremely alert and healthy, proving yet again that Pattewali was a supermom. She had already reared two litters of three and four cubs, respectively, to adulthood before this one! 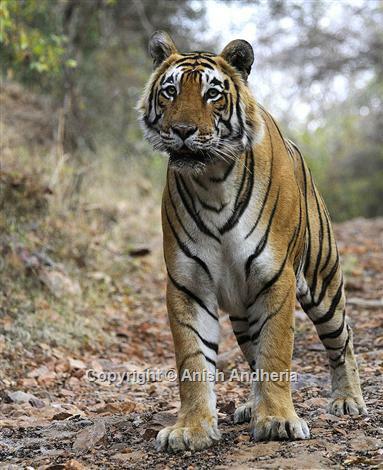 Tigresses such as Pattewali and well-protected reserves such as Pench are cornerstones of tiger conservation in India. My reverence for the tiger escalates every time I see a female raising a bunch of boisterous cubs in a remote forest of this breathtaking country; I know the pressures that our last remaining forests are facing at the hands of poaching, forest degradation and uncontrolled development. PUGMARKS IN THE SANDS OF TIME: For generations, Indians have either revered or feared the tiger. The influence that this large carnivore has had on people and cultures can be gauged from its depiction on various sculptures, rock paintings, seals, ancient artefacts and religious beliefs. Having said this, the tiger pre-dates humans on this planet by over two million years. Molecular evidence suggests that the genus Panthera dates back to more than six million years and that the radiation of the genus occurred in eastern Asia. Fossil records of the tiger dates back to about two million years, much before the modern man(Homo sapiens) walked on this planet. It has been estimated that the tiger evolved 2.2 million years ago, although some scientists suggest a divergence of the tiger from other Panthera species between 2.9 to 3.7 million years ago. Many centuries ago, the tiger was widely distributed across most of South Asia, Southeast Asia and Russia. However, over the last century, its global range has declined by 93 per cent and its population has plummeted from well over one lakh to a paltry 3,500! Of the 13 countries that harbour this magnificent carnivore, 12 collectively support below 1,800 individuals. 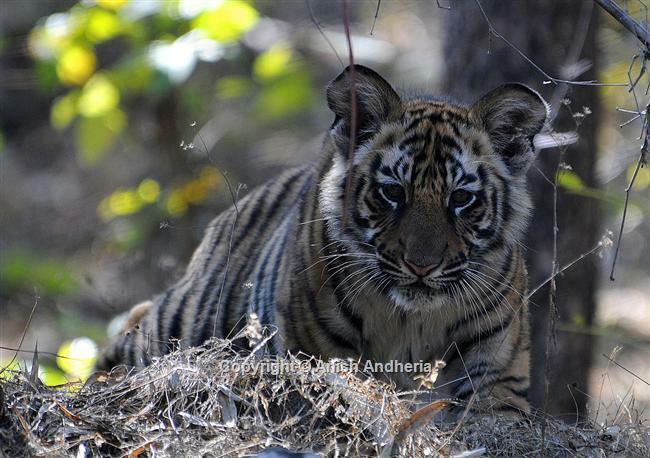 India, alone, harbours the remaining 1,700, constituting about 50 per cent of the world’s wild tiger population. While this seems encouraging, it is a mirage of sorts as these 1,700 tigers are scattered in several disjointed, small populations across a vast country with an area of about 32,03,970 sq km and a burgeoning human population of over 1.2 billion. THE NUMBER GAME: Four decades ago, when Project Tiger was launched, unlike today, we knew very little about the needs of the tiger. Since then, our understanding about this elusive carnivore has grown. Several long-term studies have revealed the secrets of the elusive large cat. 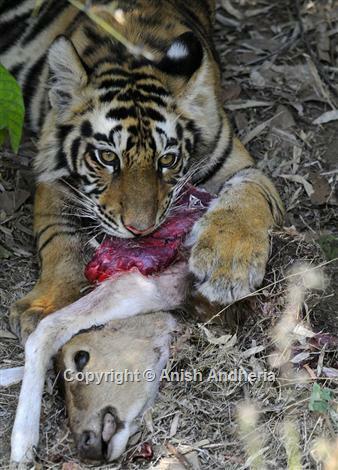 We now have unbiased information about the dietary habits, breeding biology and other behavioural aspects of the tiger. Over a year, a male tiger and a female or a sub-adult male require an average of 2,250 kg and 2,075 kg of meat, respectively. Considering the wastage and inedible parts of the prey, an adult tiger’s actual annual dietary requirement is about 3,100 kg of live prey. This means that it needs to kill as many as 50 sambar- or adult chital-sized animals to meet its yearly energy needs. We also know that a large carnivore eliminates about 10 per cent of the standing biomass (prey) and hence, it is estimated that one tiger requires about 500 medium-sized prey animals so that it can hunt 50 individuals each year. 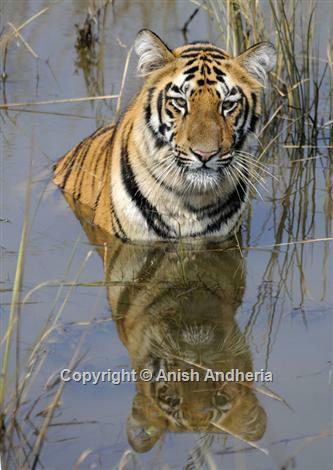 Consequently, by estimating the standing prey-base, it is possible to gauge the total number of tigers that a habitat can support (carrying capacity). Research has shown that tigers do not randomly kill the prey they encounter. 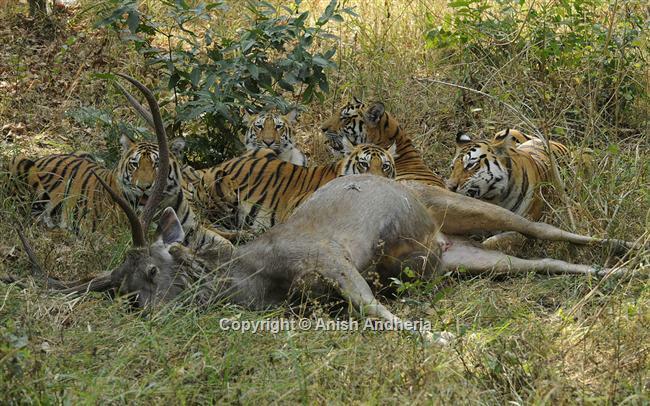 In parks where large ungulates (hoofed animals) are present in good numbers, tigers take disproportionately larger number of gaur and sambar despite the abundance of smaller prey (chital and wild pig) whereas, in places where large ungulates are scarce, tigers manage with chital and other smaller prey. 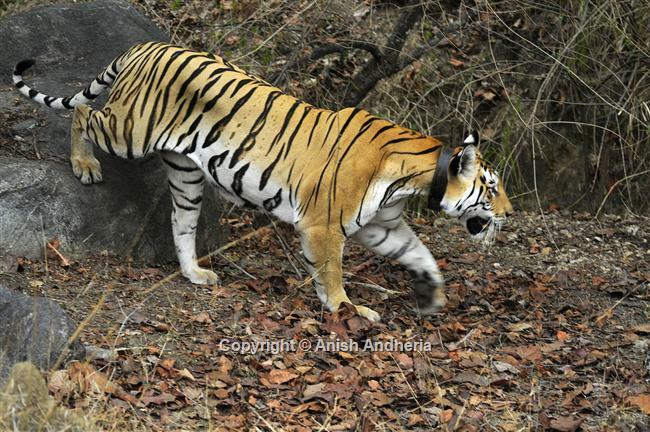 Tigresses monopolise breeding within fixed ranges that contain high prey densities. They mate with large breeding males whose range may cover two to three female ranges. In addition to this, there are transient males, who do not breed but wander back and forth through their natal range and surrounding areas, trying to establish their home range. On reaching a certain age and size, these transient males frequently challenge the dominant animals and sometimes appropriate their ranges. However, a large number of young males lose their lives in the process. On an average, two to four cubs are born after a short 105-day gestation. The cubs depend on their mother’s milk for the first eight weeks, after which the female gradually introduces them to meat and trains them for nearly 20 to 24 months so that they can master the art of stalking their prey. 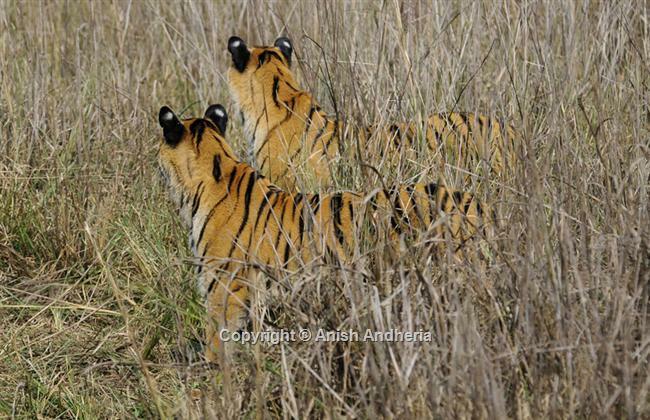 In other words, it is the breeding female, which occupies the central position in a tiger’s social structure. The propagation of their race is largely dependent on how successfully she brings up her litter. AFTERMATH OF THE SARISKA DEBACLE: We failed to learn from the Sariska experience, and fairly soon after that, Panna too lost all its tigers. 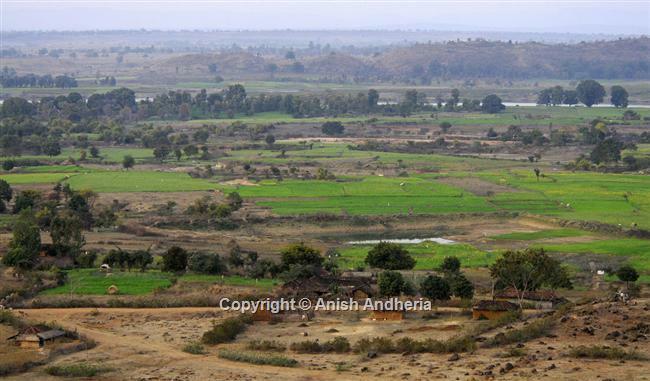 There were several similarities between the extinction processes of these two magnificent landscapes - they were both isolated habitats with almost no possibility of immigration or emigration of tigers; there were several villages within their administrative boundaries with huge populations of livestock; they were both surrounded by traditional poaching communities; above all, a stronger reaction was warranted from the park management when researchers tried to warn them about their depleting tiger populations. As a result, once the poachers reduced the tiger numbers below a minimum threshold, the population rapidly slid towards extinction despite abundant prey. 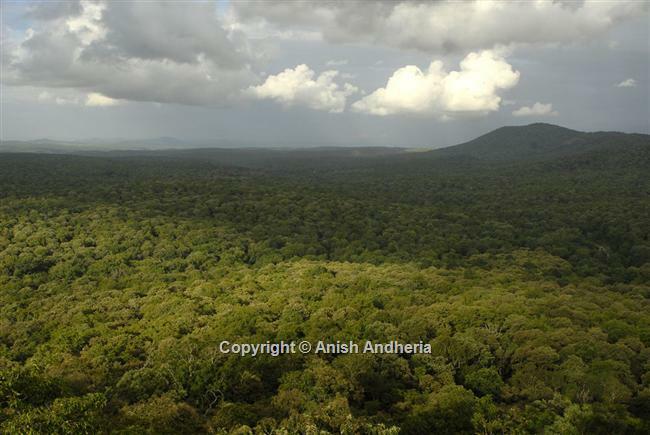 Unfortunately, the government’s present developmental regime is creating terrestrial islands that are completely disconnected from nearby forests. With increasing pressure from the mega-development sector, it is becoming extremely difficult to keep the last remaining corridors intact. Linear intrusion from roads, railway tracks, canals and transmission lines is having a detrimental influence on the already thin corridors. Mining is, and has always been a big culprit as far as severing of wildlife corridors is concerned. Unless various ministries, despite conflicting interests, come together to device an integrated approach to development, tiger forests will get irreversibly fragmented, thereby increasing the probability of local extinctions by a magnitude. History has shown that isolated tiger populations such as those on the islands of Bali and Java are extremely vulnerable even to a small degree of poaching and habitat degradation. Having understood the ecology of tigers and their prey, it is fairly easy to predict the fate awaiting India’s many fragmented tiger populations. A) Be large enough or have enough medium- and large-sized prey animals to hold at least 20 breeding tigresses. For example, Corbett (Uttarakhand), Kanha (Madhya Pradesh), Tadoba-Andhari (Maharashtra), Kaziranga (Assam), Bandipur (Karnataka), Sundarban (West Bengal), etc. 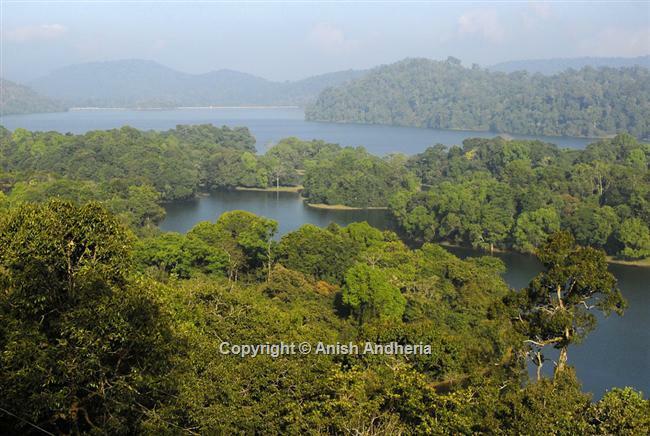 B) Be contiguous with other tiger reserves. For example, individually Parambikulam (Kerala) and Anamalai (Tamil Nadu) may not meet criteria ‘a’, but jointly they do. Even Mudumalai ( Tamil Nadu) is small by itself, but because it is contiguous with Bandipur and Nagarahole (Karnataka), it qualifies as a reserve that can contribute to a viable tiger population. C) Be devoid of all kinds of human disturbances such as villages in the core zone, illegal logging, extraction of firewood, incidence of man-made fires and poaching of both prey and tigers. 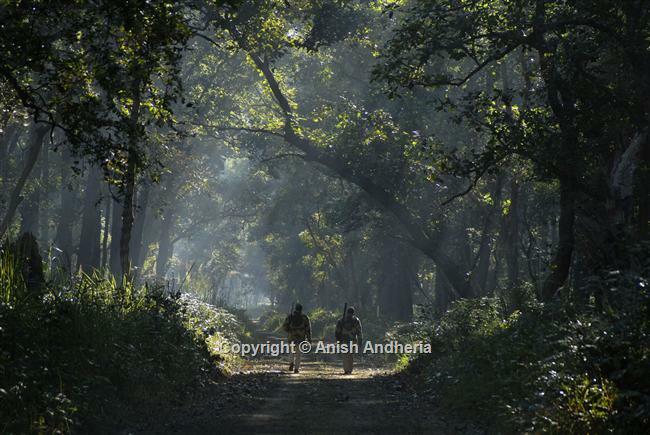 For example, Satkosia, a 755 sq km tiger reserve in Odisha, has as many as 106 villages within its boundary. Of these, 33 are inside the core itself. 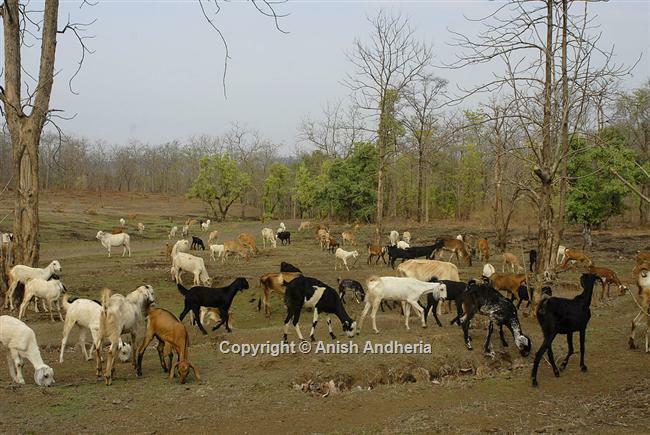 In addition to this, there is a huge population of livestock in these villages. Understandably, the forest department got pictures of only two tigers in their recent camera trapping exercise, indicating that it supports very few tigers! 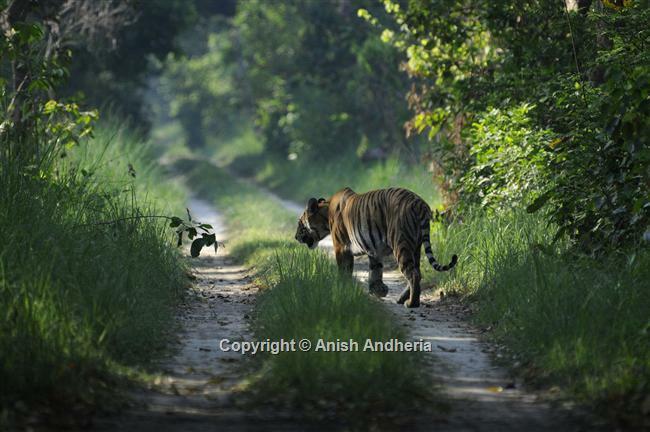 D) Be connected with other tiger reserves through a healthy corridor. 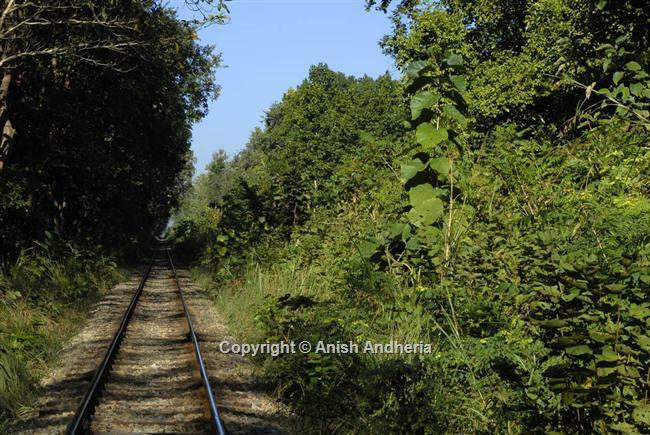 For example, Dudhwa (Uttar Pradesh) is made up of three separate protected areas – Kishanpur Wildlife Sanctuary, Katarniaghat Wildlife Sanctuary and Dudhwa National Park.